MC 90XX - Maximizes functionality! This size-optimized forklift mobile computing asset management solution is ideal for any style of forklift, especially when space is at a premium. 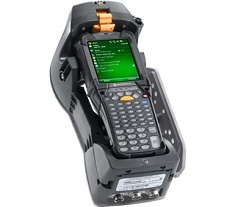 The ability to mount an MC90XX Series mobile computer and easily remove it from the cradle provides the best of both worlds — workers can use the device as needed, in handheld or forklift-mounted mode. Asset management solution mobile computer and cradle are sold separately. Built for the harsh environment of the forklift, with the ability to handle 14 GRMs of random vibration, 35,000 shocks at 30 Gs and over 100,000 insertions and removals of an MC90XX Series mobile computer. The cradle enables full access to the MC90XX display and keyboard when docked within the cradle; ability to remove MC90XX eliminates the need to purchase second handheld device for forklift operators. Support for 9-30VDC and 18-75VDC forklifts enables use of solution in virtually all forklifts, ensuring charging capability and full shift availability of docked MC90XX and tethered peripherals, eliminating the need for additional desktop cradles and spare batteries. RAM mount compatibility enables easy installation with all forklift types: sit down, stand up and walkies.